On your next trip to Maharashtra, make time to see the amazing rock cut Buddhist sites of Ajanta and Ellora that are as scenic as they are spiritual. While we always speak of Ajanta and Ellora in the same breath, I actually found out that they are 100 km apart! So how do you see these places could be your possible next question? Well the best way is to stay at Aurangabad and then cover Ajanta on one day and Ellora on another. Well, for one you will certainly need a good chunk of the day to explore each of these places and secondly trying to do both on the same day is too much of a stretch. Again the common element of the Buddha – interpreted in rock cut architecture (at Ellora) and cave paintings (at Ajanta) is so unique here that you will not stop marvelling. The best part is that these caves are quite different and yet have a common Buddhist angle. It is also amazing to note that these caves date back to several thousands of years ago and are still in great shape which is a silent tribute to the monks who built them. So here is what to watch out for in Ajanta and Ellora. The caves of Ajanta are the oldest among the UNESCO World Heritage Sites in India and date back to the 2nd century B.C. There are about 30 caves in all which were used both as prayer halls as well as monasteries. It is believed that they were built in two phases (Hinayana Phase and the Mahayana Phase) and the carvings and paintings were done hundreds of years after the caves were built. The distinguishing feature of the Ajanta caves is that they have beautiful mural paintings that are masterpieces of Indian art but unfortunately today very few of them survive. Also among what you can see – the paintings are quite faint. Nevertheless these paintings are worth navigating all the 350 odd number of steps you need to climb to navigate your way here. While there are many paintings, some of the more interesting ones are from the Jataka tales and incarnations of the Buddha. These caves are all dedicated to Buddhism and are believed to be a monsoon retreat of the Buddhist monks who used them. These caves were excavated in a horse shoe bend of rock scarp 76 metres in height overlooking a narrow stream. When you look at the caves from the other side, this makes for a stunning visual against the backdrop of the verdant valley. As you make your way from one cave to the other, it is the beautiful carvings of Buddha that will amaze you. Some caves have an upper level too and the best part is that all the carvings are different. It is a long walk to reach the end of the caves but this is where you will see a large reclining Buddha that is so serene that it will make the walk worth it. The best part is that no two caves are identical so there is a lot to see. Try to keep a few hours in hand do that you can explore the caves at leisure. The picturesque caves are a great way to come up and close with Buddhism and when you make your way out you must make a stop at the shopping complex. This is where you can pick up some if the well known stone work artefacts and Buddha figurines. And just strike a bargain and chances are you will get a good deal and also a lovely souvenir to take back as well. 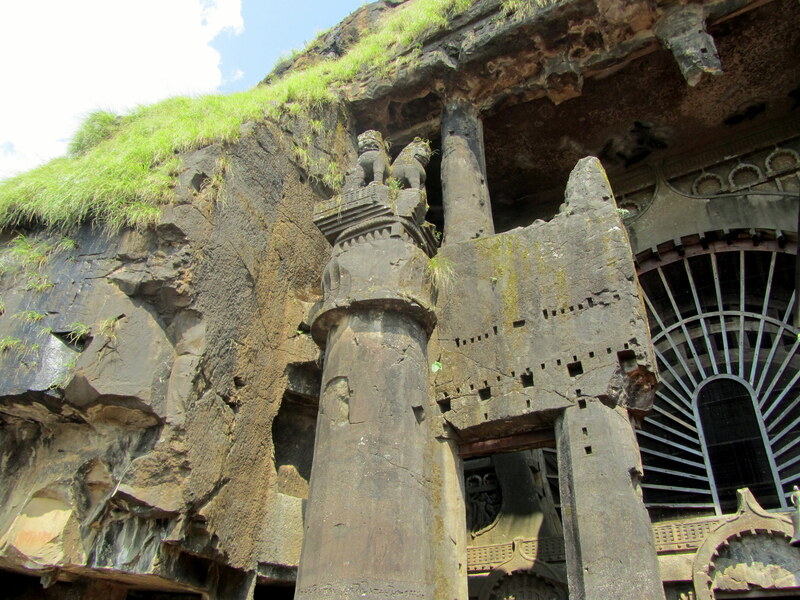 Located in the North West part of Aurangabad, Ellora has 100 caves of which 34 are open to the public. 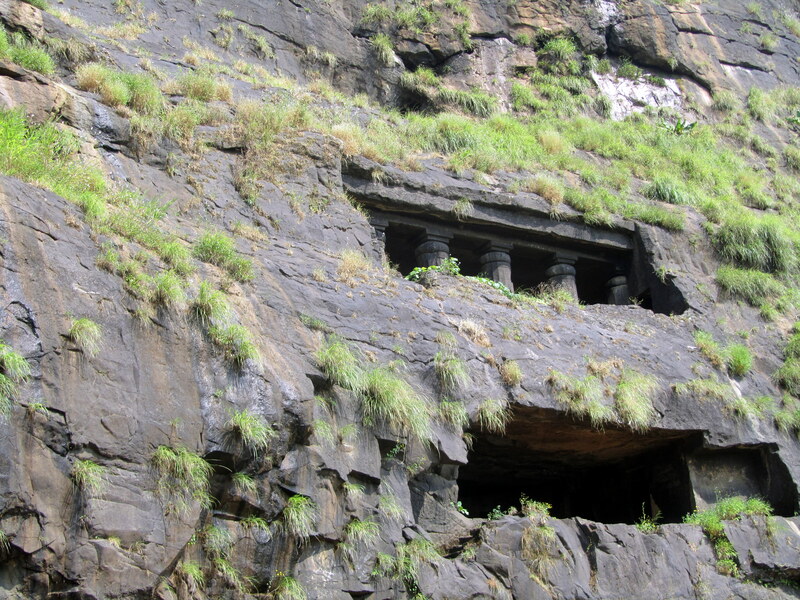 These caves are dedicated to Hinduism, Buddhism and Jainism. Constructed between the 6th and 10th century A.D., these caves are among the largest rock hewn monastic temple structure in the world. A great example of religious diversity and tolerance, there are caves 1-12 are Buddhist caves, caves 13-29 are dedicated to Hindu and Jain faith is depicted in caves 30-34. Of the Buddhist caves only one is a prayer hall and all others are monasteries. Do stop at Cave 5 as which had a hall like look with parallel refectory benches on both side and a Buddha statue in the centre. Another beautiful cave is the artistic pillared cave number 10 that has a stunning visual of a seated Buddha on a preaching position. This is the most famous cave also called the carpenter or Vishvakarma cave and the intricate carvings are a delight. The Hindu caves were built between the 6th and 10th century and Cave 16 dedicated to Lord Shiva is more like a temple modelled on the lines of Mount Kailash. This magnificent structure that is believed to have taken 100 years to complete is replete with statues of various Gods including the avatars of Vishnu. There are five Jain caves as well here and depicts the Jinas or the spiritual seers who have attained liberation from the cycle of rebirths. Do look at Cave 32 that is Indra’s assembly hall that has two levels and the upper level has elaborate carving especially the lotus on the ceiling that must not be missed. The statue of Gomatesvara, in deep meditation with vines, animals, snakes and scorpions is a marvel that must not be missed. 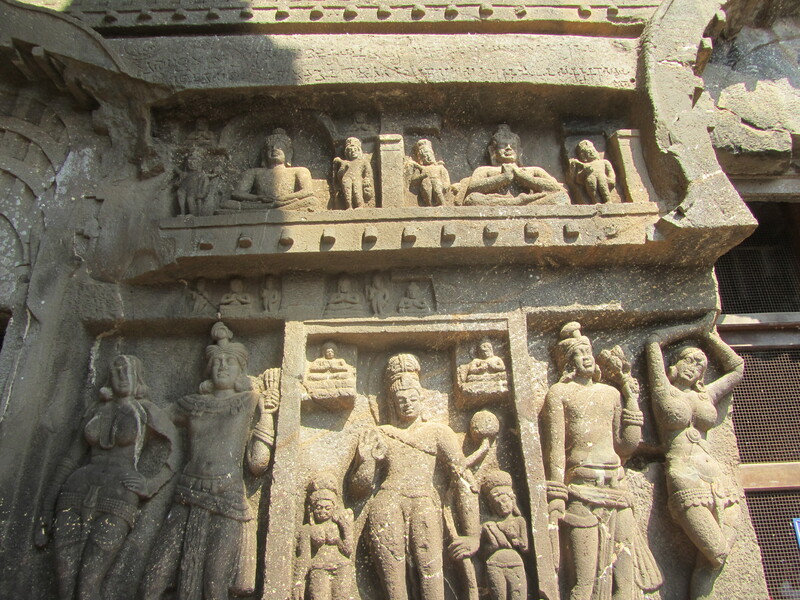 While you are in Ellora one thing that will catch your attention is the beautiful stone carvings that are on the exterior walls of the caves and temples. These again are testimony to the art of times gone by. In all a visit to these caves is a great way to come up and close with Buddha and also take an inward journey that is as peaceful as it is serene. Reach: Aurangabad has a good rail and road network from other places in Maharastra. Pune would be an ideal start point from where you can reach Aurangabad by road. Stay: Aurangabad is equidistant to both Ajanta and Ellora and has several budget and luxury accommodation options. Food: Try the local Maharastrian specialities like Poha and Sabudana Kichidi while you are here. Tips: Carry a lot of water with you as these places can get very hot especially during the summer months. Adequate sun protection and a hat will help.